Hong Kong is situated at the south-eastern tip of the mainland of China. 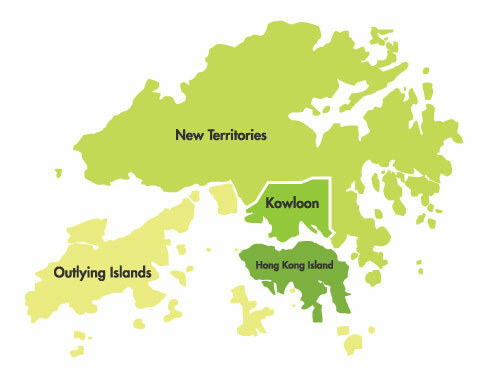 A total area of just under 1100 square kilometers covers Hong Kong Island, Kowloon Peninsula, and New Territories as well as a number of outlying islands such as Lantau Island, Lamma Island, etc. The city centre is in the south-western part of Kowloon Peninsula and northern area of Hong Kong Island and in where you can find most hotels, restaurants, shops and office buildings. Since 1985, the Legislative Council of Hong Kong has been housed in the Old Supreme Court building, which is located in the heart of Central, Hong Kong. Bank of China Tower, located at No.1, Garden Road, is a flourishing centre of activity in Hong Kong's business and financial core. Lan Kwai Fong is an L-shaped, cobble-stoned lane surrounded by clusters of skyscrapers. Nearby lanes are also buzzing with bistros and pubs in Hong Kong's trendiest nightlife area. IFC is the new heart of Hong Kong and includes Hong Kong's tallest office building, a luxury shopping mall and cinema. It offers a wide range of upmarket international restaurants and bars along Staunton Street, Elgin Street and Shelley Street. The HSBC Main Building is the headquarters of The Hongkong and Shanghai Banking Corporation Limited in Central, Hong Kong. It is located along the southern side of Statue Square at the location of the old City Hall, Hong Kong. Pacific Place is one of the most prestigious shopping malls in Hong Kong since its opening in late-1989. Specializing in the collection, study and display of tea ware, the branch museum at Flagstaff House features at its core the generous donations of Dr K.S. Lo (1910-1995), which include many fine examples of the famous Yixing teapot. Western Market, renovated in 1991 and converted into a shopping complex, is an Edwardian-style building featuring shops selling arts and crafts and fabrics. The square was named after the giant statue of a golden Bauhinia blakeana at the centre of the area, situated outside the Hong Kong Convention and Exhibition Centre, where the ceremonies for the handover of Hong Kong and the establishment of the Hong Kong Special Administrative Region was held in July 1997. The Hong Kong Convention and Exhibition Centre is one of the two major convention and exhibition venues in Hong Kong. It is located in Wan Chai North, Hong Kong Island. Built along the Victoria Harbour, it is linked by covered walkways to nearby hotels and commercial buildings. Times Square is a major shopping centre and office tower complex in Causeway Bay. It’s one of the hottest tourist spots in Hong Kong. Looking down from The Peak you'll be amazed by the spectacular view of the surrounding skyscrpers, Victoria Harbour and Kowloon. This attractions now features more than 100 incredible wax likenesses of stars, world leaders and sports heroes displayed in five totally interactive themed settings that are spread over three floors within the completely refurbished Peak Tower complex. Ocean Park is located on the southern side of Hong Kong Island, covering more than 870,000 square metres of land. There are three attraction areas, which are the Lowland, the Headland and Tai Shue Wan. A popular market town on the sunny south side of Hong Kong Island, Stanley's relaxed ambience, crisp sea environment and bargain buys like watches and souvenirs have made it world famous. This crescent-shaped stretch of sand is one of the most beautiful beaches in Hong Kong. Star Ferry is a passenger ferry service operator in Hong Kong, China. Its main routes carry passengers across the Victoria Harbour, between Central, Hong Kong Island and Tsim Sha Tsui, Kowloon. The Kowloon Park is one of the largest public park in Tsim Sha Tsui, Kowloon Peninsula, Hong Kong. The park area is about 13.47 hectare and the entrance is free of charge. The Hong Kong Cultural Centre is a multipurpose performance facility in Tsim Sha Tsui of Hong Kong and is located next to Hong Kong Space Museum & Hong Kong Museum of Art. The Hong Kong Space Museum is a museum for astronomy and space science in Tsim Sha Tsui, Hong Kong. The Hong Kong Museum of Art is one of the city's largest museums and features the finest examples of ancient Chinese art from different dynasties. Avenue of Stars, located in Tsim Sha Tsui, highlights the territory's hundred-year history of filmmaking. The Avenue of Stars features commemorative plaques, handprints of movie celebrities, descriptive milestones and kiosks with movie memorabilia. Harbour City is a large shopping mall in Tsim Sha Tsui, Hong Kong. The complex is located along the west side of Canton Road, stretching from the Star Ferry terminal in the south to China Hong Kong City in the north. Whampoa Garden the largest private housing estate located in Hung Hom, Kowloon, Hong Kong, and is built on the site of the former Whampoa Dockyards. It comprises a few shopping complexes with many restaurants, shops and department stores. Langham Place is a business and commercial complex which opened in the fourth quarter of 2004 in Hong Kong and is comprised of a shopping mall, hotel and office tower. The Ladies' Market is located in the heart of Mongkok and Yaumatei. You can find out lots of amazing array of bargain clothing and accessories. Temple Street is a street located in the areas of Jordan and Yau Ma Tei in Kowloon, Hong Kong. It is well known for its night market and the busiest flea market at night in the territory. Sik Sik Yuen Wong Tai Sin Temple is one of the famous temples in Hong Kong. Apart from being an important religious centre, it is also a scenic attraction full of beautifully ornamented traditional buildings. The bridge was named after two of the islands in Hong Kong, namely Tsing Yi and Ma Wan . It has two decks and carries both road and rail traffic, which also makes it the largest suspension bridge of this type. Stretching along the waterfront in Sai Kung town centre, Hoi Pong Square is home to a dozen quality seafood restaurants. The Hong Kong Wetland Park is an ecotourism facility aimed at promoting green tourism, education on environmental protection and wetland conservation. The Ngong Ping 360 experience starts with a 25 minute cable car ride from Tung Chung to a culturally themed village high atop a mountain plateau on Lantau Island. The majestic figure of the seated Buddha is 34 metres high and was cast in China. Weighing 250 tonnes, it was unveiled in 1993. Visitors can climb the 268 steps to reach the platform where the Buddha is seated. Hong Kong Disneyland is a unique tourist spot which also includes of two Disney-style hotels. Hong Kong Disneyland will offer a diverse range of food at various restaurants in the park. Located less than half an hour by ferry from bustling downtown Hong Kong, Lamma is a famous tourist spot for seafoods and Chinese traditional culture.